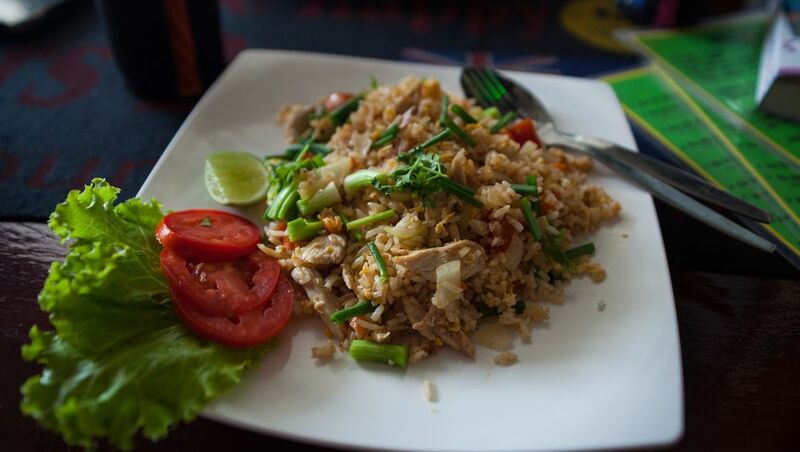 This Thai take on chicken fried rice is so good and super easy to prepare. Very aromatic, this fried rice recipe features fresh basil and lime leaf for an exquisite flavor that is a big step above ordinary. If you don't have a lime leaf, you can easily substitute 1 teaspoon grated lime zest for this recipe. Add lots of fresh basil and you'll have wonderful fried rice that is delicious enough to serve the King of Siam himself! If using leftover (cold) rice, place it in a mixing bowl and drizzle over 1/2 to 1 tablespoon oil. Work oil through with your fingers, breaking apart any clumps to get individual grains. Set aside. Mix all stir-fry sauce ingredients (chicken stock, fish sauce, soy sauce, sugar, and chili sauce) together in a cup and set aside. Place 2 tablespoons oil in a wok or large frying pan over medium-high heat. Add the garlic and shallot and stir-fry 30 seconds. Add the chicken and lime leaf strips (or lime zest) and stir-fry 3 to 4 minutes, or until chicken is cooked. When the wok or pan becomes dry, add a little of the extra chicken stock, 1 to 2 tablespoons at a time, to keep ingredients frying nicely. Push ingredients to the side of the wok/pan, and drizzle a little oil into the center. Crack the egg into this space and quickly stir-fry to scramble it (this only takes a few seconds). When the egg is cooked, combine it with the other ingredients. Add the rice and pour over the stir-fry sauce. Using a scooping motion (scooping up from the bottom of the wok), stir-fry the rice together with the other ingredients. The wok should be hot and dry at this stage. Use medium-high heat. Continue stir-frying in this way until the rice is hot and of a consistent color (5 to 7 minutes). Remove from heat. Add the spring onion and fresh basil, and toss. Now do a taste-test for salt and flavor, adding more fish sauce (instead of salt) until the desired flavor is reached. If too salty, add a squeeze of lime juice. If too sour, sprinkle over a little more sugar. Sprinkle more fresh basil over before serving. If desired, serve with Thai chili sauce on the side.